Eurowings Europe, the chamber of commerce and the union Vida have finalized a collective agreement for the on-board employees of Eurowings Europe in Austria. The collective agreement will apply retroactively as of March 1, 2018. In addition to a comprehensive package of additional benefits, the collective agreement has provisions for an increase in basic salary of up to 20 percent. Additional variable earnings of up to 25 percent of the basic salary are possible depending on output. Furthermore, pay-scale adjustments to the basic salary of two percent each have already been agreed upon for 2020 and 2021. For new hires in cockpit and cabin, professional experience that captains, first officers and pursers have gained with other airlines will be recognized. “This includes, among other things, a mobility package and comprehensive coverage for employees in case they become unfit to fly – this will secure a better quality of life for our crews,” says Dieter Watzak-Helmer. Top Copyright Photo: Eurowings (Europe) Airbus A319-132 OE-LYY (msn 4256) PMI (Ton Jochems). Image: 943733. 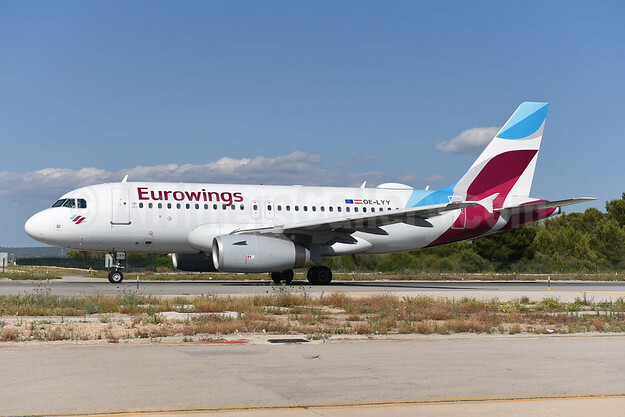 This entry was posted in Eurowings, Eurowings Europe and tagged Airbus A319-132, Eurowings Europe, msn 4256, OE-LYY on October 2, 2018 by Bruce Drum.